Walt Disney loved animals, as evidenced by the many films he made about them. But outside of the True-Life Adventure series, most of his films tended to be about dogs. Calling upon the talents from some of his other animal films, he decided to make one about a very special cat. 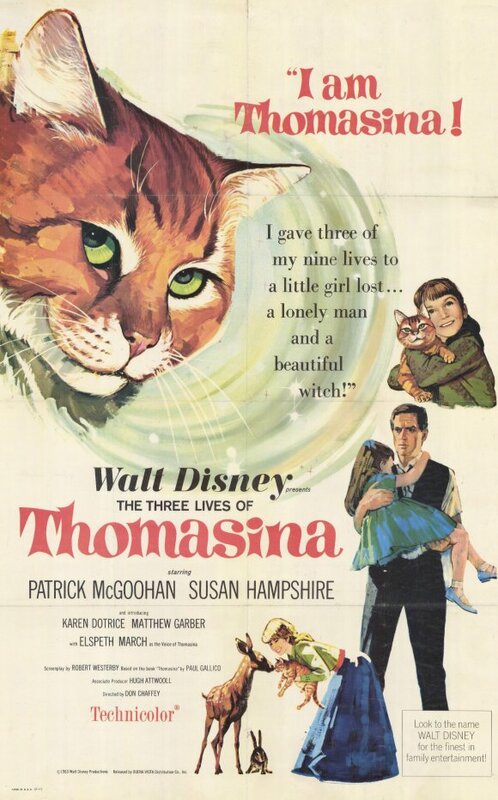 The Three Lives of Thomasina is based on a book by Paul Gallico called Thomasina, the Cat Who Thought She Was God. Don Chaffey was hired to direct his second Disney film, after having success with Greyfriars Bobby. The screenplay was adapted by Robert Westerby, who also adapted Bobby. Patrick McGoohan stars in his first Disney film, although he had starred in a three part episode of The Wonderful World of Color called The Scarecrow of Romny Marsh, which was theatrically released in the UK and against the odds, was theatrically released in the US in 1975. Susan Hampshire was cast in her first of two Disney films as the beautiful witch. A few familiar faces from Greyfriars Bobby appear in this film including Laurence Naismith, Alex Mackenzie and Vincent Winter. The film was shot on location in Scotland and at Pinewood Studios in England, where they reused many sets from a Disney TV movie called The Horse Without a Head. Several cats were used to play Thomasina, one of which reportedly held up production for two days when it refused to perform a specialty trick. Terry Gilkyson wrote the title song. The film opens with footage of Thomasina as her theme song plays. From there, Thomasina introduces the happy family she lives with and explains that she had to die to make them this way. The film flashes back to when widowed veterinarian Andrew McDhui and his daughter Mary moved to town and took her in. As a vet, Andrew is strictly a man of science and doesn't lend his patients' owners any condolence. When one of Mary's friend brings an injured frog to her father, he refuses to treat him. So the boy takes the frog into the woods to the cottage of Lori, who he perceives to be a witch. She takes in the frog and heals him with love. Thomasina goes missing one night and when Mary finds her, she has come down with tetanus. Andrew is operating on a blind man's seeing eye dog and makes a decision not to put Thomasina down, but saves the dog. Mary is beside herself with grief and the children in the town give a funeral for Thomasina. When Lori attends the funeral, the children run off and she analyzes Thomasina's body and discovers that her heart is still beating. She takes her home to cure her. Meanwhile, Mary refuses to speak to her father. When Thomasina is well enough to leave Lori, she has no memory of her life with Mary. Andrew gets a bad reputation around town and people start to take their animals to Lori for care. When Andrew goes to confront her, he helps her rehabilitate a wounded wild badger and friendship forms between them. Thomasina is compelled to follow Andrew home. Mary chases after her at night during a rain storm and gets sick. When a gypsy circus comes to town that is abusing its animals, Lori goes to help them and is treated with hostility. Luckily Andrew comes looking for her and saves her and the animals. He asks Lori to come visit Mary and while she is there, Thomasina's memory returns to her and she runs home to Mary, who wakes up and regains the will to live. The film ends with the marriage of Andrew and Lori and according to Thomasina, the beginning of her third life. The Three Lives of Thomasina was released on June 3rd, 1964, although it had a special engagement release in New York City on December 11th, 1963. Critics agreed that it was charming, but felt it lacked excitement and the pace was too slow. Audiences didn't respond well to it and it was a box office disappointment. It debuted on TV a year later in 1965 and was released on home video in 1985. The film was given a PG rating when it had to be classified in 1992 for thematic elements. Thomasina is an enjoyable film, but its far from perfect. The story unravels a little too slowly and while the film opens and closes with Thomasina, she is far from the main character which makes it odd when it tries to return to her self-narrated portions. It has many similarities to Greyfriars Bobby, but that film has the benefit of being based on a touching true story that is more memorable. However, over time Thomasina has become to more famous and well known of the two films. Walt Disney cast Karen Dotrice and Mathew Garber in Mary Poppins based on their performances in this film. Author Paul Gallico was invited to the set several times and reportedly didn't get along with Walt, despite Walt referring to him as his "good friend" in the TV introduction to the film. The Three Lives of Thomasina is currently available on DVD. The film is presented in a widescreen aspect ratio of 1.66:1, which is close to its original theatrical ratio of 1.75:1. A restoration appears to have been done and the film is free of noticeable flaws. Bonus features include the original theatrical trailer, an interview with Susan Hampshire who plays Lori, and a featurette about Disney cats that includes Walt's TV introduction to this film. This was my favorite movie when I was 4 in 1964, I named my citty Thomasina, unfortunately he was hit by a car!! !